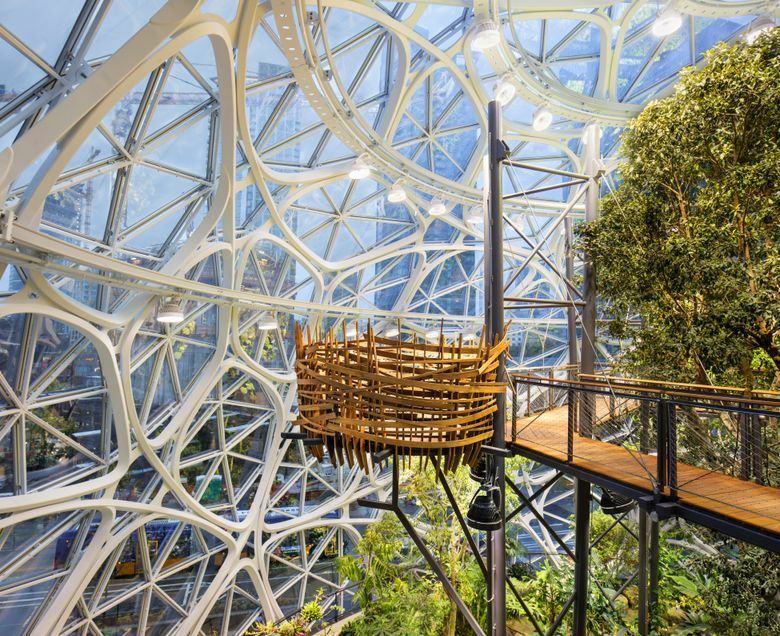 The hard-to-miss Amazon Spheres are both a workplace and a jungle, a pre-opening-day tour reveals. Sitting on one of the half-dozen lounge chairs in a secluded spot nestled just under the four-story-high steel superstructure that caps Amazon’s glass-paneled Spheres, the feeling is like resting in a space capsule ready to launch. A short walk away, past a living wall of carnivorous Asian pitcher plants and Philippine rhododendrons, tables and chairs are set by beds of succulents. Downstairs, a wooden path circles the leafy canopy of a towering 49-year-old tree, stopping at a few meeting nooks. Want to check out Amazon’s Spheres? Here’s how to get in. These different environments in the three connected domes convey the same sensation. You quickly forget you’re in a bustling office park downtown. For the building’s designers, that’s the point. Will Amazon’s Spheres replace the Space Needle as the new symbol of Seattle? Amazon’s Spheres, the centerpiece of the retail juggernaut’s $4 billion urban campus, will open to employees — and, in a limited fashion, to the public — next week, a milestone in a decadelong corporate growth spurt that has reshaped Seattle. The company, for most of its 24 years, preferred to operate under the radar in its hometown, posting no signage to indicate its presence in its office buildings even as the company and its blue-badged employees came to occupy much of the South Lake Union and Denny Triangle neighborhoods. But in the Spheres, Amazon has built an architecturally ambitious focal point and symbol of its status as Seattle’s largest employer and one of the most dynamic entities in corporate America. John Schoettler, Amazon’s real-estate chief and a Seattle native, hasn’t been shy about comparing the Spheres to other architectural landmarks in the city. Amazon will hold an opening ceremony for the Spheres on Monday, with Gov. Jay Inslee and Seattle Mayor Jenny Durkan expected to attend. But the Spheres already have achieved a measure of fame. Tourists stopped by to snap photos of the orbs during their two-and-a-half years of construction. Some critical locals who saw the edifice as a corporate vanity project gave it a label of their own: Jeff Bezos’ Balls, referring to Amazon’s founder and CEO. And when Amazon announced last year that it was seeking a second headquarters, photos of the Spheres, still under construction, found their way into news coverage around the world as a symbol of a corporate giant so massive that it was hunting for a second home. The flora inside the domes is the work of a team of Amazon horticulturists who were charged with scouring the globe for interesting plants and growing them in a 40,000-square-foot greenhouse in Woodinville. Four years of growth later, and supplemented by a few older plants acquired from other conservatories, the Spheres feel like a mature, if unusually well-manicured, jungle. Unlike most jungles, the Spheres are a workspace. Banks of tables, secluded meeting nooks and benches strewn throughout the complex can seat up to 800 people. 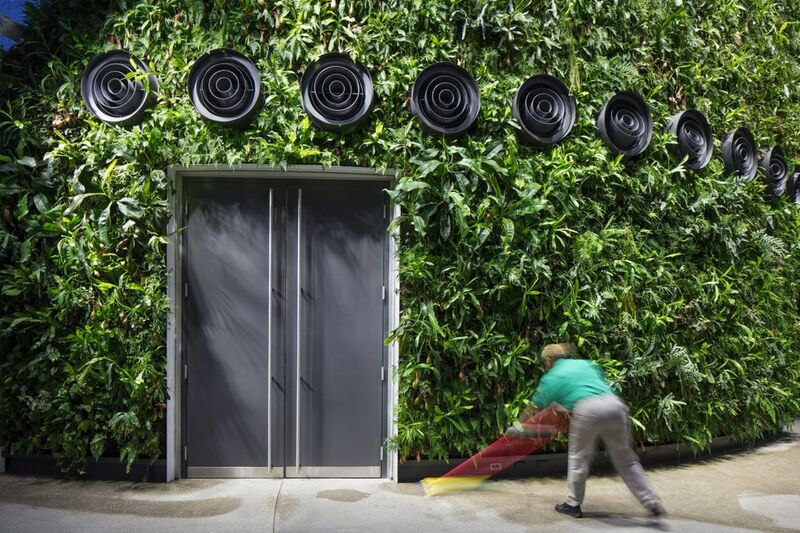 Amazon envisions the building as a change of pace for its workers, a place to “feel differently, to think differently,” said Ron Gagliardo, the Spheres’ lead horticulturist, who leads an in-house team of four others. To keep the aisles clear for that feeling and thinking, Amazon’s gardens will be, for the most part, private space. And to avoid a crush of people when the Spheres first open, Amazon has a reservation system for employees who’d like to enter. It is booked solid through April, with reservations from 20,000 people, roughly half of Amazon’s workforce of more than 40,000 Seattle employees. The general public can sign up for free tours of an exhibit area on the ground floor of the Spheres, and Amazon’s guided, twice-weekly headquarters tours will soon include a stop inside the Spheres. The company also aims to open the space to the public regularly, a spokesman said, but Amazon hasn’t finalized those plans. Bezos, during the planning process, looked at renderings showing the development of the Spheres’ trees — starting at a relatively sparse Year One, and onward to a more lush Year Five. Instead, the famously demanding chief executive ordered up the denser, green look of Year Five on Day One. 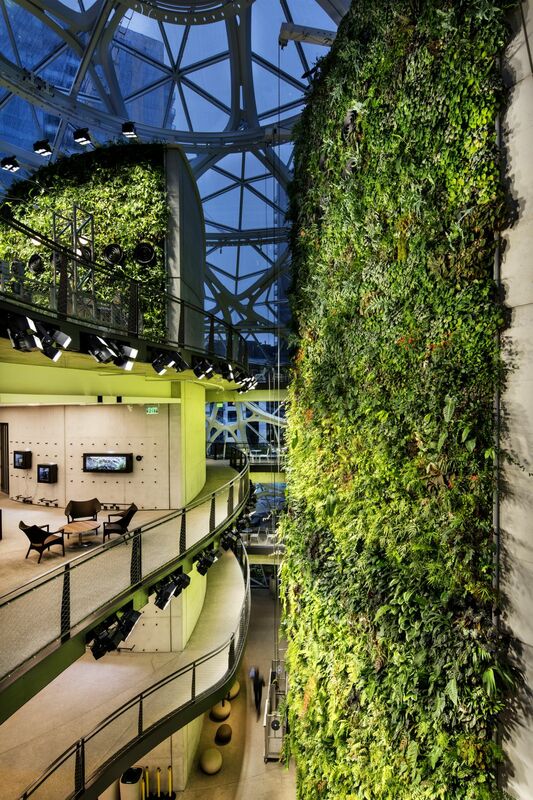 Employees who enter from the Sixth Avenue side of the Spheres will encounter a living wall, 60 feet high and packed with 200 plant species, that extends vertically through the central dome’s four stories. Just to the right is a tank with aquatic plants and animals native to the Amazon. More than 400 species of plant life are divided, roughly, into two sections. A garden centered in the Seventh Avenue dome evokes the New World, with plants like the plinia cauliflora, or Brazilian grape, of mostly Central and South American origin. The centerpiece, though, is a native of Australia by way of a California tree farm: the four-decade old Port Jackson fig, nicknamed Rubi, lowered by crane into the sphere in June. The Sixth Avenue sphere holds an Old World garden, which draws primarily from Africa and Southeast Asia, including an Australian tree fern, the first plant to arrive when it was set down in May 2017. 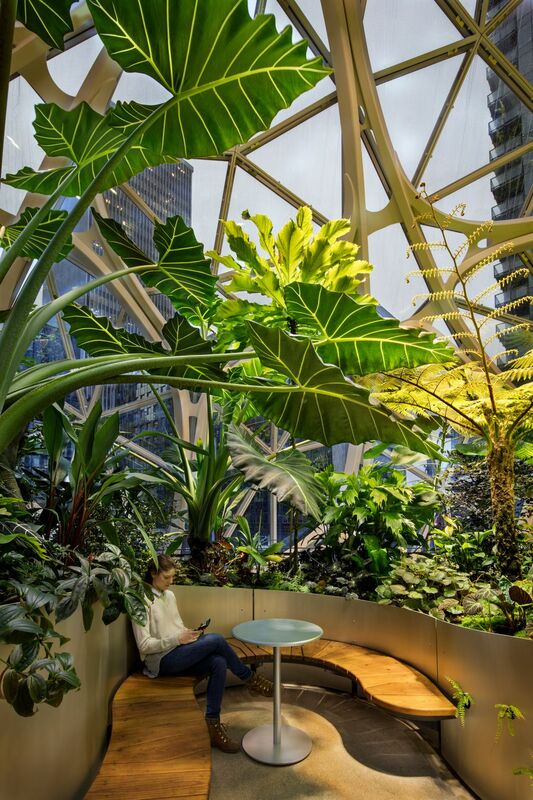 The plants, many native to the cloud forests of Central America or Southeast Asia, were selected because those environments match what Amazon was looking for in its Seattle Spheres: a space cool enough for humans in work attire to be comfortable, yet warm and humid enough for tropical plants to thrive. The Spheres are kept at 72 degrees and 60 percent humidity during the day, and 55 degrees with 85 percent humidity at night. The architect behind the project, NBBJ, designed a complex system to keep that balance. 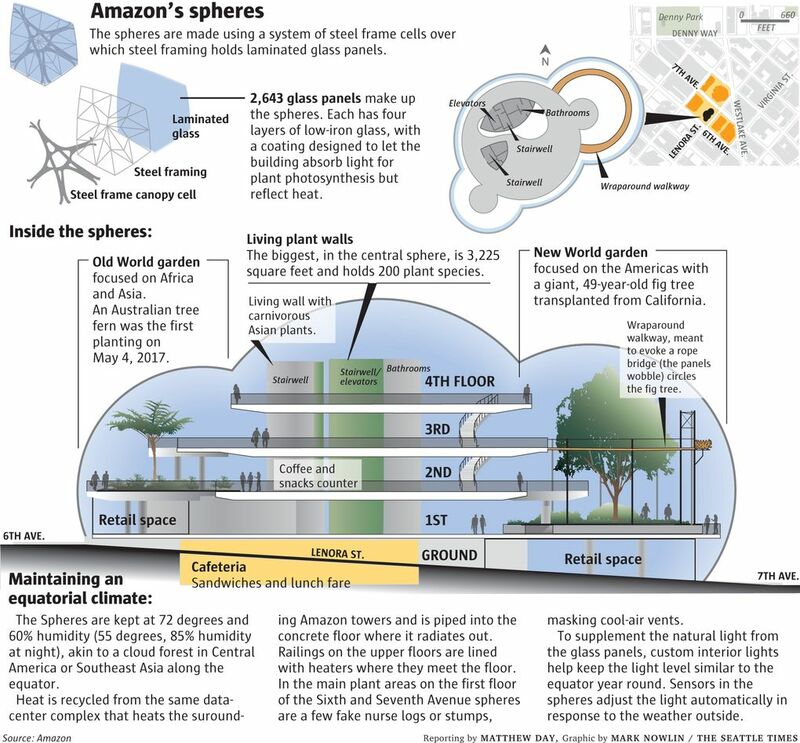 Like Amazon’s skyscrapers, the Spheres are warmed in part by recycled heat generated from a nearby data center, with the heat piped through the concrete floors and, on the upper floors, handrails. Interspersed in the main plant areas are fake logs and tree stumps that conceal air-circulating pipes. The spheres are made up of about 2,600 angular glass panels that have a coating designed to let in light for plant photosynthesis and reflect unnecessary heat back into the environment. Amazon supplements the sun’s rays with dozens of stadium lights designed to make up for Seattle’s dark winters. Sensors automatically adjust the light levels inside for an even 12 hours of simulated daylight to feed the plants. Feeding the humans will be Renee Erickson, the award-winning Seattle chef, who will operate a restaurant, as well as a doughnut-and-coffee bar, inside the Amazon employees area. The occupants of two retail areas open to the public haven’t been announced. In contrast to many of its rivals, Amazon offers its workers comparatively few corporate perks. Employees make their own coffee and pay full freight at the company cafeteria. A major element of Amazon’s sales pitch to job candidates is its home in an urban core, something suburban rivals Apple, Google and Microsoft can’t match. As of next week, the retail giant adds another benefit: a curated slice of nature inside three geodesic domes, called, at various stages of design and construction, fly eyes, glass orbs, melted-together Milk Duds and biospheres. For Schoettler, who says naming buildings can be a harder enterprise than naming children, the shortening to Spheres seemed a natural moniker for Seattle’s newest corporate landmark.